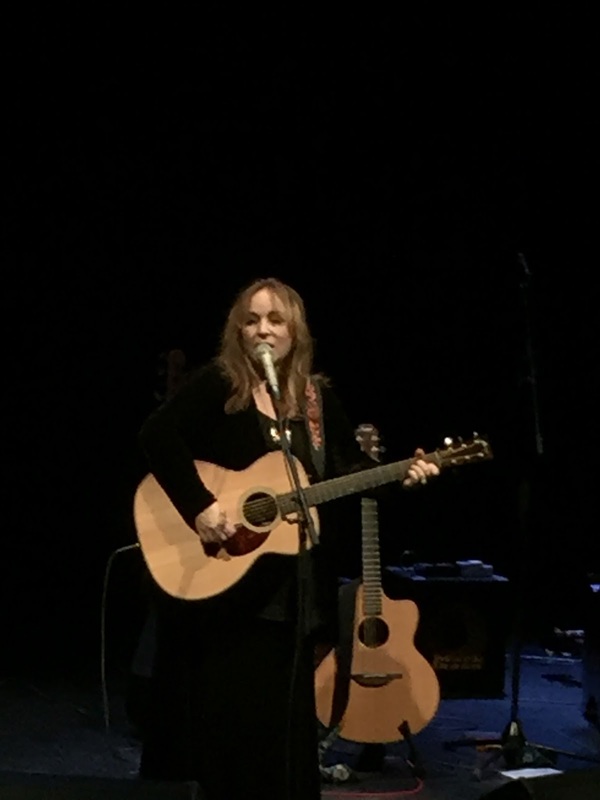 A twentieth anniversary has connotations of being in the coming of age bracket and the full band show of Gretchen Peters did just that during this current celebratory tour of Britain. Gretchen’s talent as a singer-songwriter is sealed in the vault and her musical relationship with Barry Walsh has been cast in gold for a long time. The live development of working with Christine Bougie and Conor McCreanor added an extra spring to the step of the stage show and now the introduction of Colm McClean has raised the band bar to the level of other pre-eminent artists. Gretchen’s ascendancy continues to re-define her peak and this evening’s show at a sold out Artrix Theatre in Bromsgrove drew many cries of the best yet. From a viewpoint of seeing her live in several formats and different sized venues over the last decade, it is difficult to argue with this claim, not just the pedal steel and electric guitar of Colm garnishing the songs, but Gretchen herself finding further incredible depth in conveying her compositions to a mesmerised audience. A couple of songs into the first of the two high class mirrored sets, we were given an introduction to how effective the pedal steel guitar was going to be on stage with a gilt edged contribution to the scintillating Tom Russell co-write ‘Guadalupe’. By now it was apparent that Gretchen was in that transfixed zone of relaying the majesty of her songs. ‘The Secret of Life’ opened proceedings, just like it did to her solo recording year a couple of decades ago. The lyrical sharpness exclaimed in ‘the secret of life is there ain't no secret and you don’t get your money back’ whetted the appetite as Gretchen went straight into the cutting edge analysis of ‘The Matador’. This popular song with the powerful conclusion was one of three tracks from HELLO CRUEL WORLD to sparkle in the show’s first half, alongside the emotive title track and the incredibly perceptive ‘Woman on the Wheel’. At this point Colm chipped in with the first thrilling guitar solo as this top song, from still my favourite Gretchen Peters album, added an extra vibrancy to the event. It is impossible to mention this song and not wince at the vision of ‘one false move and it’s a real bad day at the amusement park’. Apart from the song which started things on the stroke of eight, the other memory lane trip during the pre-break set was ‘Love and Texaco’ from her second album and introduced as one of many car-inspired songs written at the time. The other three songs before the interval that probably brought the artists a welcome break, but not us admiring audience members, had an up to date contemporary tinge. Ben Glover, who opened for Gretchen when she last played Bromsgrove nearly three years ago, was kindly credited as the co-writer on the recently award winning ‘Blackbirds’ and from the latest studio album which housed this song and borrowed its title, the band served up a delightful version of ‘Everything Falls Away’. The remaining song from the first set saw Gretchen temporarily move away from her own writing and celebrate the work of Ben Bullington by singing one of his songs. 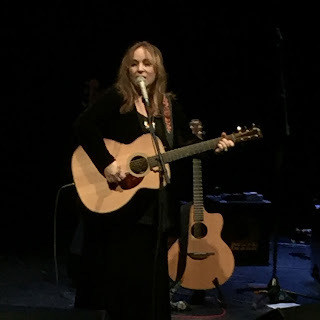 ‘Ring Around the Moon’ was one of the indulgent inclusions on the retrospective album Gretchen has just put out to support this tour and flourished with the aid of further pedal steel. ‘Could the second half surpass the first?’ was pondered during the interval and we all had a firm idea of what was to come. ‘Well she lit up the sky that fourth of July’ still raises the hairs on your arm when the second verse of ‘Independence Day’ begins, as this classic now has a settled live format of Gretchen solo on piano, when Barry kindly vacates the seat. In the same vein that you know each tour sees her popularity in the UK increase; two songs with a special place in many fans hearts over here find their inclusion on the set list. ‘When You Are Old’ was not surprisingly played as a tribute to the late Terry Wogan. While one of several emotional moments arrived as the line ‘And I wept in the arms of Jesus for the choice you made’ was sung from ‘On a Bus to St. Cloud’. This timeless classic slipped seamlessly into the brilliant ‘Idlewild’ as that sad pre-encore moment arrived. However before we prepared ourselves for the anticipated climax, there were several contrasting highlights from the second set, led from the front by the ever heart wrenching ‘Five Minutes’ with the classic line ‘last weekend she ran off to meet a boy in Tennessee, just like I used to run to you’. This song is fast moving up the Gretchen Peters favourite scale, but tonight it had a serious rival in ‘If Heaven’ which was sung just before the band appeared after the break. ‘When All You Got is a Hammer’ was another tune brought to life on stage by the influence of the quartet and once again praise needs reserving for Colm for playing a neat solo piece on ‘Black Ribbons’. The remaining song to mention from the second half was Gretchen delving back a couple of albums to dig out the ever faithful ‘Sunday Morning (Up and Down Our Street)’. So how was this successful night going to end? There had been a lot of press about the recorded duet with Bryan Adams ‘When You Love Someone’ appearing on the new compilation album and this duly made an appearance (sadly minus Bryan) as the first encore song. This just leaves the finale and previously the territory of a Gram Parsons, John Prine and Rolling Stones song. This evening all these had to make way for the old Rodney Crowell/Waylon Jennings number ‘I Ain’t Living Long Like This’ which appeared on the last tour, but had pride of place this year as the closer. While credit has to be given to Conor for playing the essential bass role all night, it was left for a piano/guitar duel from Barry and Colm to end the show with Gretchen admiringly looking on, no doubt proud to see how her band is evolving. This tour has been a resounding success for Gretchen Peters who was totally bowled over by the response, especially the reaction and aura to her sold-out Union Chapel gig in London. She was buzzing throughout the show and after, with a glow so grateful that many folks were continually being moved by her music. The good people of Worcestershire and the West Midlands played their part in this successful phase which on the positive side shows no sign of abating or peaking. A truly memorable show consigned to the gift wrapped side of the memory bank.